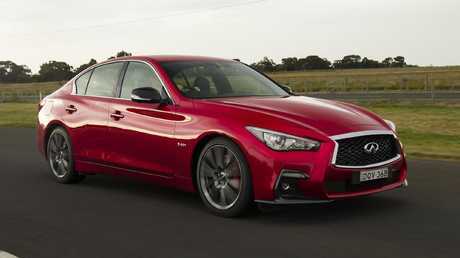 2018 Infiniti Q50 Red Sport. FROM the drive-by-wire steering to the electronic shock absorbers and adaptive transmission, the Q50 3.0T Sport is a showcase of emerging mobility software. It's like playing Gran Turismo in the real world, with the responses from the various sensor-equipped components able to be adjusted. The reality is most drivers will find settings they like and lock them into the Personal mode. Inside, a dual-screen infotainment set-up is backed by 16-speaker Bose audio. Despite all the digital devices, the parking brake is still the old-fashioned in-the-footwell type. The Q50 is powered by a punch twin-turbocharged six-cylinder engine. 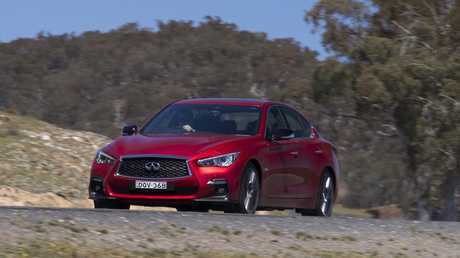 Twin turbochargers endow this 3.0-litre engine with an ever-ready 224kW/400Nm, making the Q50 a potent drive without being too aggressive under a loaded throttle. Power is sent to the rear wheels of the four-door mid-size coupe through a slick seven-speed automatic transmission that will change early if the drive mode is in the standard position to help achieve a claimed combined fuel use of 9.2L/100km. Flip it into sport and it will hang on to revs with more tenacity, with the feeling boosted by sharper suspension and steering response. In terms of buying power the Infiniti Q50 3.0T Sport is hard to beat. The $64,888 drive-away deal makes an $80,800-$83,400 on-the-road price for the similarly powerful Lexus IS350 F Sport look expensive, especially as it mirrors the price of Infiniti's 298kW/475Nm Q50 Red Sport. The cheapest of the six-cylinder European rivals is the Jaguar 35t S at more than $100,000 in your garage. Infiniti backs the Q50 with a four-year/100,000km warranty. Service intervals are six months/15,000km and the first six visits to an Infiniti dealer will cost $1396. The Q50 is considerably cheaper than its rivals. Beyond the sunroof, which eats into rear headroom for taller adults, the Q50 is impressively kitted out for the money. The build quality is hard to fault, the powered front seats and steering column all have plenty of adjustment. The interior trim is leather and alloy and the seats are supportive front and rear. The dual-screen display in the centre console takes some getting used to but, ultimately, is probably more efficient than scrolling through multiple menus on the one screen. Dual infotainment screens simplfys the controls. 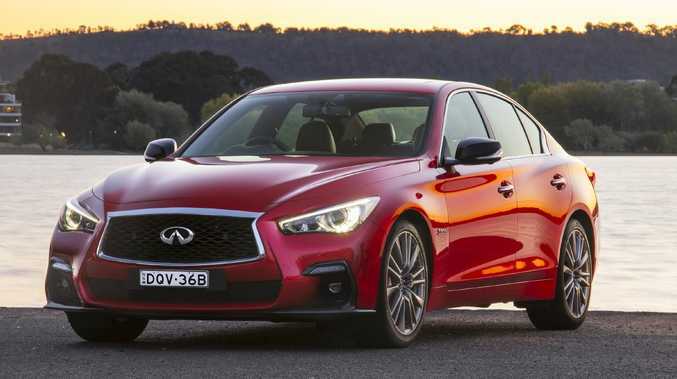 Prestige cars are expected to have a decent set of safety features once you've stepped up from the base model and the Q50 follows the formula. The adaptive cruise control isn't too aggressive when someone drops in to your lane and the autonomous emergency braking likewise doesn't intervene when you're rounding up a parked car. Active blind-spot and lane-assist software stops the Q50 from veering out of its lane at inopportune times and the active lane control will help steer the car around wide corners when freeway driving with the cruise control set (and your hands on the wheel).